Ostersund, Sweden - May 30, 2014: Close up of the Google analytics main page on a computer screen. Google Analytics is a service offered by Google that generates statistics about a website's traffic. Understanding your customers well enough to ensure you’re giving them what they want and need — that’s the key to success for any small business in any industry. It’s easy enough to learn about the customers and prospects who actually walk into your store or office, but what about those who visit your digital storefront? They’re every bit as important as the customers you deal with face-to-face. How do you get to know them? Google Analytics is one powerful — and free — website analysis tool that can help you better understand your current and potential customers. It can also help you understand how people are interacting with your company website, where they’re coming from and how often they visit, what parts of your site are capturing their attention and what parts aren’t sparking interest. 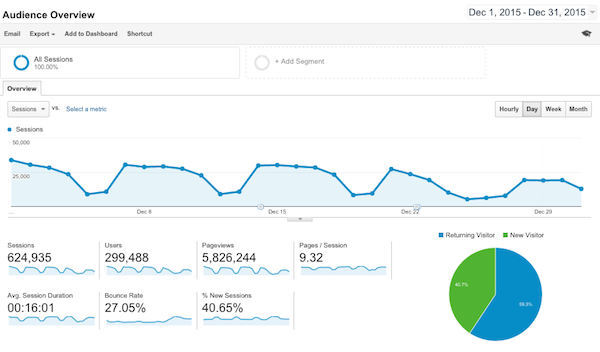 It’s easy to see why Google Analytics is one of the most popular website analysis tools — it’s easy to use. You don’t need to be a digital genius to work with this most useful of Google’s website tools. But if you do find yourself with questions, Google offers a plethora of ways to get answers, from its own Google Analytics YouTube channel to an active blog and detailed help pages. Choose the account to which you want to add the property. Use the dropdown menu in the Account column to do this. Once you’ve chosen the account, in the Property column, click on “Create new property” from the dropdown menu. Choose an industry category and reporting time zone. After you’ve added your website as a property, you need to set up the tracking code in order for Google to begin collecting data on your website. Use Google Tag Manager to add Google Analytics tags. This route makes it easier to incorporate tags from other sources like AdWords Conversion Tracking. Or, if you only want to add the basic Google Analytics tracking code, you can add the tracking code into the HTML of every page on your website. If you think you want to set up Google Tag Manager, Google provides comprehensive information on how to do that, and they suggest you start by reading their About Google Tag Manager page. Since we’re focusing on Google Analytics for beginners, let’s talk about the second option, which is incorporating the tracking code into your website’s HTML. Sign into your Google Analytics account, select the Admin tab, and choose the property you’re working on from the Account and Property columns. Don’t do anything to change the snipped portion. Just copy and paste it into the HTML for every web page you want to track. Be sure to place it right before the closing tag in the page code. 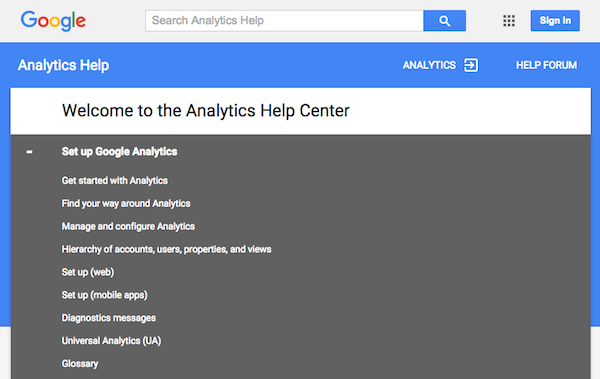 We strongly encourage you to read the Google Analytics help pages on these topics; this blog is merely a summary, and we couldn’t begin to explain the process half as well as Google does! Armed with the primer we’ve provided, dive into Google’s more detailed information and you’ll soon develop a better understanding of just how powerful a website analysis tool Google Analytics is. Google has created an intuitive, versatile and robust dashboard that allows you to crunch numbers in a multitude of ways. Learning how to use the dashboard is easy, and it can help you really understand how well your website is performing, what’s working, what’s not, and where you can improve. Number of visitors, percentage of first-time visitors and percentage of repeat visitors. Average length of time visitors stayed on the page. Where visitors were from and what language they speak. If you want to see stats for a different time period, it’s easy to change the date range. You can also narrow the reporting time frame to month, day, week or even hour. Moreover, you can compare two sets of date ranges to see how your results have changed over time. The Audience Overview can tell you how many people visit your page, what time of day they’re visiting, where they’re from, what browser they’re using to access your site, and even what size monitor each visitor is using. Acquisition allows you to view a traffic report that shows where the majority of your traffic comes from — search engines, referrals from other sites or different pages within your own site. If you’re wondering where visitors are entering your site, the landing page report can tell you that. Data showing visitors entering from your site’s index page may mean they’re finding you through a search engine or may have bookmarked your site. If one particular page gets a lot of traffic, however, it may mean the content is a popular topic. You can also track ad campaigns using landing pages. Want to know how many people are actively using your site? The Active User Report lets you choose a date and see how many people have actively used your site within the past seven, 14 and 30 days of that date. The data can help you understand if your website is holding users’ interest, or if you need to re-evaluate what you’re doing. The keywords report shows you keyword terms visitors searched for on a search engine, such as Google or Bing, before visiting your site, and how long they stayed (on average) on a particular page after searching for a keyword. Driving traffic to your website is important, but you also want those visits to convert into potential or actual customers. The conversions report allows you to track how many visitors signed up for your newsletter, who clicked on your shopping page and more. It’s important to understand how you’re acquiring new customers, and the Treemaps report can help you do that. The report graphically interprets incoming traffic across different channels, so you can quickly understand traffic trends. Segmentation is key to the success of your marketing trends, and the Cohort Analysis report can help you identify like-minded groups of visitors. You can group users through a range of parameters, such as the date they first visited your site, then track their behavior over time. For a visual walkthrough of some of the above mentioned features, click on the video below. All the analytics and data are aimless if you don’t have goals in mind. Goals can help you measure your site’s performance to see if it’s achieving what you want and need it to do. Google classifies a “goal” as an activity that’s completed, like a conversion, that contributes to your overall business success. For example, e-retailers might count a purchase as a goal. Destination goals let you designate a pageview or screenview as a conversion. Duration goals look at the time a user spends on a page and treats that duration as a conversion to measure engagement. Event goals consider how a user interacts with your site and counts specific behaviors as a conversion. Page/screens per session goals evaluate the number of pages or screens a user sees per session, with a specified number counting as a conversion. Once you create a goal and save it, Google Analytics begins collecting that data immediately and will continue to do so until you turn off the goal. Once you have your goals set up, you can analyze these conversion rates in the Goal Reports. Other reports also track goal conversions, including Visitor Reports, Traffic Reports, Site Search Reports, and Events Reports. Of course, like any website analysis tool, Google Analytics has a paid premium version that offers additional functionality. However, the basic, free account has enough versatile tools to satisfy most small businesses. Google never rests on its laurels, so we can expect to see more changes and new developments for Google Analytics in 2016. Following the blog, taking advantage of the YouTube channel and read through help pages to keep abreast of updates and to understand how to leverage the power of Google Analytics to benefit your small business. This article was written by VerticalResponse from Business2Community and was legally licensed through the NewsCred publisher network. Next articleSmall Business: Should You Say You’re Sorry on Social Media?